Coconut oil has quickly become one of the most universal oils used today and not just for cooking but also for weight loss, hair and skin care as well as dental care. Coconut oil is available in two main forms: refined and unrefined (often called virgin) coconut oil. Both types of oil come with their own sets of advantages and disadvantages. 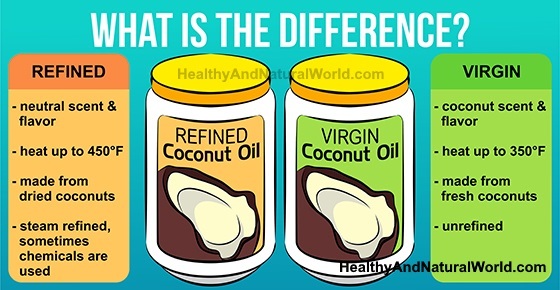 In this article I am going to describe the differences between refined and unrefined (virgin) coconut oil and describe the advantages and disadvantages of each type to help you decide which is best for your needs and to your health. Refined Vs. Unrefined Coconut Oil – How Each Type is Produced? Refined coconut oil (virgin coconut oil) is made from copra, or dried coconut meat, that has been purified with bleaching clays due to the levels of contaminants that arise during the drying process. It is then treated with high heat to remove its distinctive odor and flavor. Some producers use chemical solvents to extract as much of the oil from the copra as possible. Some producers of refined coconut oil may also partially hydrogenate the oil too, which forms trans-fatty acids. Unrefined coconut oil is pure or virgin oil that is extracted from fresh coconut meat rather than dried. The coconut meat that is used to make unrefined coconut oil goes through two processes: quick drying or wet milling. The most commonly used process is quick drying, which dries the coconut meat quickly and mechanically expresses the oil. The process of wet milling occurs when the coconut milk is extracted from the fresh meat. The milk is then fermented, boiled or separated using enzymes. This process does not require bleaching or the use of additives because it is done so quickly. Unrefined coconut oil is not exposed to high heat, so it retains its natural odor and flavor. Both refined and unrefined coconut oils have the same amount of medium-chain fatty acids, also known as the ‘good fats’ that may help you lose weight and control blood sugar levels. They are both mainly made up of the medium-chain fatty acid called lauric acid which has many health benefits. However unrefined coconut oil has a higher content of phytonutrients, or protective plant nutrients. The reason for it is that the process of heating the oil to high temperatures when manufacturing refined coconut oil removes many of the oil’s antioxidants, such as polyphenols. Virgin coconut oil retains a distinctive flavor and odor of coconut, whereas refined coconut oil is tasteless and odorless. Virgin coconut oil retains more nutrients than refined coconut oil. Virgin coconut oil is more expensive despite being less processed. Refined coconut oil goes bad faster than virgin coconut oil. For cooking, especially frying, the smoke point or refined coconut oil is around 450°F (232 °C), which is 100°F higher than unrefined virgin coconut oil. If you are interested to use coconut oil for cooking, read my ultimate guide on how to cook with coconut oil. The process used to make refined coconut oil may add trans fatty acids to the oil due to partially hydrogenating the oil. Because of this, doctors may advise against consuming refined coconut oil as it may raise bad cholesterol levels. If you are health conscious but still prefer using refined coconut oil in your dishes, look for the brands that contain the least amount of chemical processing and are not partially hydrogenated (not containing trans fats). Unrefined virgin coconut oil also contains the fullest coconut flavor and smell as well as the most phytonutrients, or protective plant chemicals. On the other hand, refined coconut oil works better for cooking at higher temperatures with a higher smoke point. Therefore, if you don’t like your food having a hint of coconut smell or taste, you can use refined coconut oil. Some people, however prefer the taste of cold pressed virgin coconut oil in their food. In this case, and if you don’t exceed the smoke point, virgin coconut oil is the best option for you. Not all coconut oils are alike. Here are some tips for buying the type you need, whether it is refined or unrefined. Due to the chemical process refined oils go through, be on the lookout for lye or other harsh chemicals that are present in the ingredients list. There are also brands available that are not hydrogenated or partially hydrogenated, so you can get the benefits of refined oil without the bad stuff. Specifically, look for high quality non-hydrogenated refined coconut oils that use a natural, chemical free process such as steam. If choosing unrefined coconut oil, the product label typically mentions that it’s “virgin” or “extra virgin” or “cold pressed” coconut oil. Virgin coconut oils can vary in taste and smell depending how the oil was extracted. This can make the flavor either too intense or mild and can also affect the amount of nutrients you are getting. The more heating that the oil has gone through, the stronger the taste will be. A truly unrefined virgin coconut oil is made from the first pressing of raw and fresh coconut meat with no added chemicals. This type of oil should have a mild coconut flavor and scent. What About Choosing Organic Coconut Oil? Here you need to distinguish between 2 terms: organic vs. non-organic which refers to whether the coconuts were grown with or without the use of chemical fertilizers or pesticides, and the terms refined vs. unrefined (virgin) which refer to the process of extracting the coconut oil. Some sources claim that there is little need for organic coconut oil over standard coconut oil as there is minimal pesticide residue in coconut oil regardless of the production method. With that said, many people feel more comfortable with the fact that organic product generally go through a gentler processing method and don’t include pesticides, chemicals or additives in the finished product. So if you want to be sure of the coconuts journey, then certified organic is the right choice for you. Did you know that there is another type of coconut oil names fractionated coconut oil? Read my article about fractionated coconut oil and how to use it.